Well where do I start???? 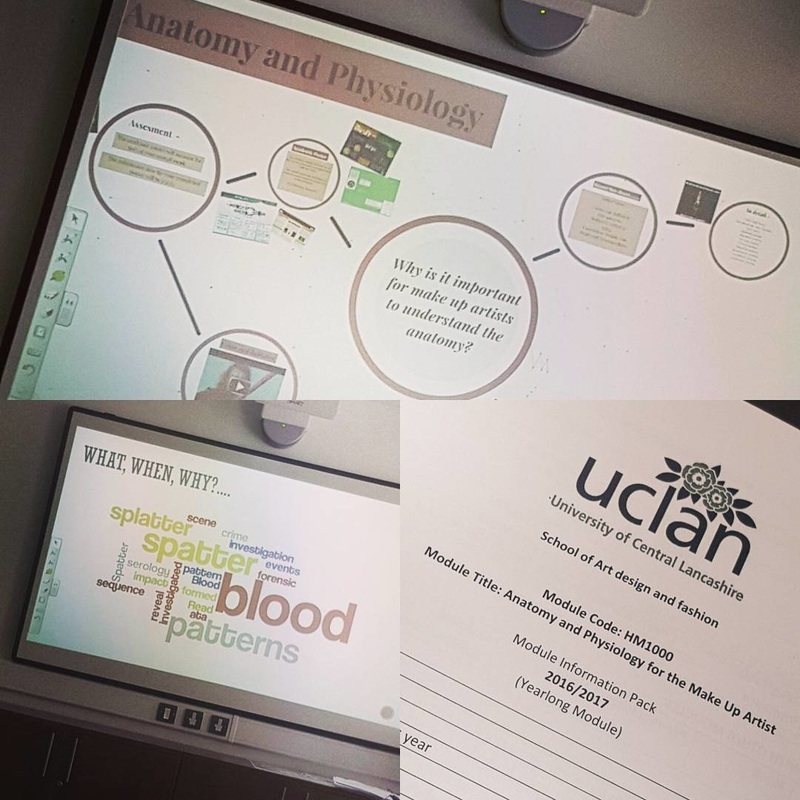 To begin with I didn’t think that we would be learning about blood splatters and bullet wounds on our first lesson on a Monday morning that’s for sure. Here we all were (myself and 16 women, yes I am the only guy, again! Haha) all eager and keen sat in anatomy and physiology and boom…We were told about what to expect in class, crime and ballistic, blood splatter, death and decomposition etc etc, to say there was a few ashen faces was an understatement haha, next we were shown a 10 min video of scenes of heads being blown off, legs and arms flying everywhere. Sarah, our lecturer says ever so casual “You have to get used to seeing the real thing, because you will have to recreate it one day. 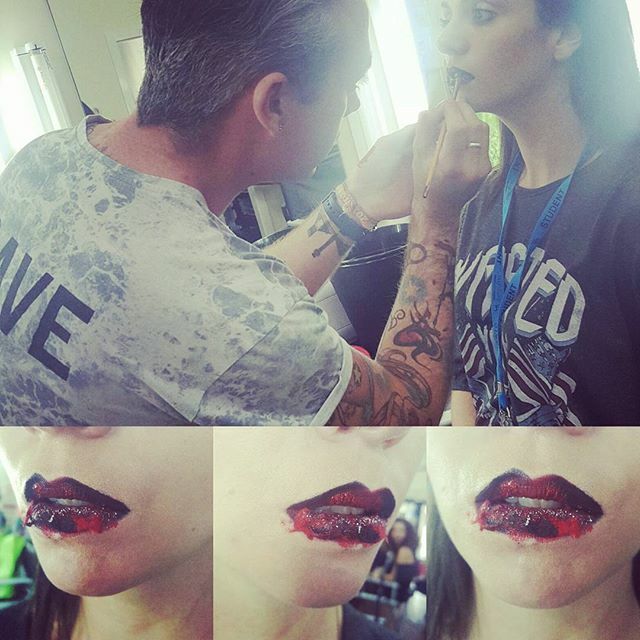 If anyone feels a bit faint just don’t worry get up and get some air”…..
Next session to throw us in at the deep end was practical application with Diane, Lip Art……. We all had to pick a word out of a basket, mine was blood!!! Great, what is it with all this blood I thought haha. Easy you would think, ohhhhhh no, not at all, especially when the last time I really picked up a makeup brush I referred to myself as Miss Sapphire and was in my teens not 30’s. So that was my first week as an MUA on my degree, I have really enjoyed it and I am excited and slightly scared of what is to come. The next pic is of me doing my first assessment, but we will leave that for next week’s blog. If fashion is the field you want to work in, but you don’t know where to start, FashionUnited is there to help. To work in the fashion industry is a a dream many people share. But besides the glamorous and creative side, it is also hard work. Here are some tips how to find a job in fashion and how to succeed. It is good to dream big and be passionate about your career, but in order to reach your goal you should know what you want. To define your goal think about your strengths and which position you want to achieve. Talk to people already working in the industry, read articles, stay in the loop to find the fashion profession that suits you. There are various job offers in fashion - so it might be good to regularly check the job portals. To simplify your job search look for platforms that focus on careers in fashion. You will be able to find more vacancies that are relevant for your search. Make sure you always know what is happening within the fashion industry at all times. You need to be up-to-date with the latest fashion news around the globe. FashionUnited offers you the latest fashion news worldwide, for free! In this dynamic industry it is a good idea to subscribe to a newsletter to receive the information regularly and directly in your email account. It is also a good idea to follow different fashion companies and bloggers on social media to get the latest information daily. You should find the program that will provide you with a solid foundation to build your career on. Therefore, try to find the best school for you, the one that will meet your expectations and will be recognized by your future employer and colleagues. There are thousands of fashion schools in the world, with different programs, structures and tuition fees. FashionUnited has a database listing many schools from all around the world. Access various school profiles that feature the latest news, courses, programs and the upcoming events of each school. Check it out! Having attended an educational institution in fashion is really important but it is in no way a guarantee to find a job. Most companies require hands-on experience through internships or volunteering. On our career page you can also find various internships and junior positions to get first experiences in the fashion industry. If you already have experience try to highlight it in your job application. Prepare yourself well and know your personal selling argument.